Beckon: There is something seriously wrong with these people. Just on the side of the road, as you enter the little town in the mountains, there is a sign: Beckon: You’re here for a reason. And I can see why they chose that. It certainly beats out: Beckon: There is something seriously wrong with these people. It’s a pity, you know, that the sign doesn’t say that. It would have been fair play. All the same, it never took too long for visitors to figure out that there was something wrong with those people. And still it was usually too late. 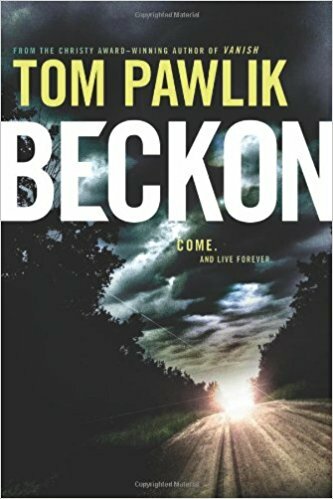 Beckon, written by Tom Pawlik, is billed a supernatural suspense. It certainly had suspense – I would even call it a thriller – but the supernatural element was thin. At least it was thin by the sometimes bizarre lights of the genre. The main peril, creepy and even chilling as it was, broke the supernatural suspense archetype of being, well, supernatural. And this leads to the novel’s greatest merits. The premise of the book is one of the most intriguing and innovative I have ever read. It kept me engaged to the very end. Tom Pawlik draws readers deeper in with skill – never too much revelation at a time, never too little. The book is divided into four parts. The first three are devoted, in turn, to Jack, Elina, and George, detailing each one’s path into Beckon and its mysteries. At the fourth part, their storylines merge. This was Pawlik’s way of pulling up the curtain, as each character stumbled onto a different secret hidden within Beckon. Pawlik also used it to concentrate attention on his heroes, to give a sense not only of where they had arrived but where they had come from. So the story, with all its revelations and dangers springing at them, doesn’t just happen to them. It seems instead to be part of a journey they were already on. I have two complaints against this book. One, the violence level was too high, and some instances were, frankly, disgusting. The casualty rate of the cast was astounding. I got the feeling sometimes that the author killed characters simply because he didn’t want them in the next chapter. When he was through with them, they were through. My second complaint – perhaps related to the first – is that the book does not fully explore the mysteries it presents. The N’watu and Beckon are both, in their way, fascinating, but their depths are left unmined. What their lives made them, what it all meant to them, is never really told. I still don’t know what made the N’watu tick. Yes, they hated and feared outsiders – but why? You cannot be afraid without feeling that you are vulnerable. What vulnerability did they see in themselves? I would ask what vulnerability they saw in their god, but I am not sure that they had one. It was never clear to whom, in their own understanding, they made their sacrifices. I can’t say that I will pick up Beckon again, but I expect it to be popular. Its premise was genuinely compelling, and it excelled in suspense and mystery. Those who enjoy thrills and chills will probably enjoy this.